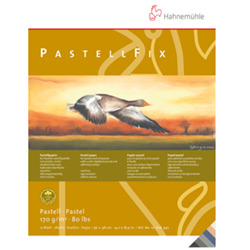 PastellFix offers artists an incomparable painting experience. You can feel how different it is from other pastel papers straight away. "The velvety looking surface is a totally new haptic experience and your chalk pastels seem to just dance across it. Working with this high quality paper is thoroughly enjoyable right from the start," says artist Monika Mori enthusiastically. Pastel pigments dissolve quickly and without the application of any undue pressure on the soft, slightly textured paper. The colour pigments adhere beautifully to the surface, where they settle gently but firmly. Blurred lines and carefully nuanced shading can easily be created with different wiping techniques. Developed especially for pastels, 170 g/m² PastellFix paper is also perfect for oil pastel, pencil, sanguine or charcoal works. The pastel painting pad contains two sheets of each of the following colours: ivory, sand, navy, steel grey, dark grey and black. The different shades are protected by transparent dividers. This paper offers professional as well as hobby artists the perfect surface for giving free rein to their creativity. The acid free paper has a cotton rag content and is felt marked.